Julie Lyon – vocal, Pat Hall – trombone, Jack DeSalvo – guitar, Mark Hagan – double-bass, Tom Cabrera – drums, play Julie and Jack’s composition Hey There Baby in performance at Dennings Point Distillery in Beacon, NY from Julie’s album MOONFLOWER. Share the post "SUMARI: One of Downbeat’s BEST ALBUMS of 2015"
Share the post "Jack DeSalvo and Dom Minasi recording Julia’s Dream"
And every Sunday in NOVEMBER. 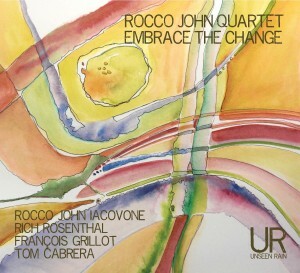 ROCCO JOHN QUARTET performing ROCCO’s composition ESCAPE from their new album.